The way that I install “Lament” is akin to improvisational exercises of the Situationists: I have the elements but I let them direct themselves through my hands. In a sort-of freejazz approach, I create “Lament” sight-specifically as a way for me to understand my emotions about the United States, my memory of its history and my current position as a part of its history. 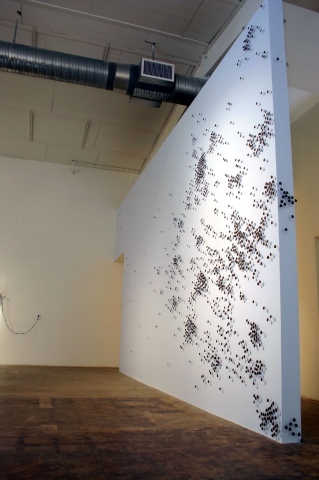 Often starting very small and growing into a swarm, this piece invokes a series of questions: Where are we? What are we doing? Why are we so separate? In this personal map, I create a poem of contemporary life. It is the “in-between” that is disappearing, and extremes are introducing themselves as natural decisions, though I strongly believe that binary thinking is dangerous and lonely. Decisions? Live in the city or the suburbs, live around a lot of people or isolate yourself. Growing up in a small town in Georgia I experienced this swarming first-hand as the rural parts were swept into suburban developments, and I grew up seeing the farmlands turn into strip malls. I believe this is not only my experience but an experience affecting many people of my generation. When I step away from what I’ve done I often see close relationships to my own journey – the memory map may reveal itself to be my reaction to development and loss of story and history. It also invokes, to me, a sense of optimism -- as a swarm can lift you up and carry you away to be replanted it can also reveal a sense of possibility and hope toward new ways of thinking, living and experiencing.